1 of 6 Line a 1-quart round bowl with plastic wrap, allowing some to overhang edge of bowl. Spoon ice cream into bowl, spreading until level. Freeze overnight. 2 of 6 Heat oven to 350 degree F. Coat an 8-inch round baking pan with nonstick cooking spray. Trace outline of pan on a sheet of parchment or waxed paper, then cut out with scissors. Fit into bottom of pan and coat paper with cooking spray. Whisk together flour, cocoa, baking powder and salt in a bowl. 3 of 6 Beat egg and 2 tablespoons water in a large bowl for 1 minute. Add 1/3 cup of the sugar and the vanilla. Beat 5 minutes, until sugar is dissolved and mixture is pale in color. Sift flour mixture over egg mixture, then fold in. Spread into prepared pan. 4 of 6 Bake at 350 degree F for 15 to 18 minutes, until cake just begins to pull away from side of pan. Invert onto wire rack to cool. 5 of 6 Combine powdered egg whites and 2/3 cup warm water in a large bowl. Beat until soft peaks form, then gradually beat in remaining 1/3 cup sugar, until stiff peaks form. 6 of 6 Increase oven temperature to 475 degree F. Place cooled cake layer on a baking sheet. Remove ice cream from freezer and invert onto cake layer (if sticking, press a warm kitchen towel against bottom of bowl). Remove plastic wrap. 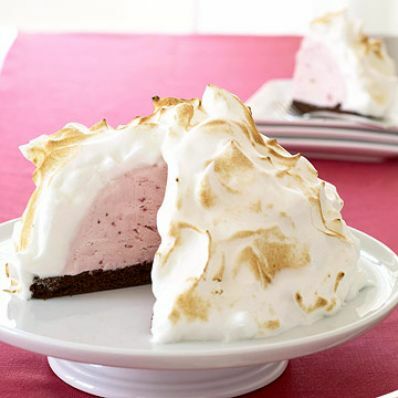 Spread whipped egg whites over ice cream and cake to cover, swirling decoratively. Bake at 475 degree F for 4 minutes, until browned. Slice into wedges and serve immediately. Cover and return any leftover slices to freezer.